Family Pharmacy Teams With Marcus! Home » Family Pharmacy Teams With Marcus! Well, it’s finally happened! Ever since the release of my books in the fall of 2006, I’ve looked for a retailer in my hometown. You’d think this wouldn’t be so challenging, but it sure was! Then, a retailer found me! In March, I was honored to be the key note speaker at the National Honor Society induction at my alma mater, Montgomery County R-2 in Montgomery City, MO. Well, Jack and Janet also decided to inquire about becoming a retailer of “After This…” and “The Other End of The Stethoscope.” I, of course, was ecstatic to be able to offer books to readers in my hometown by way of a local retailer! 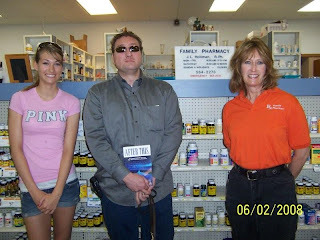 Family Pharmacy is located on North Sturgeon in Montgomery City, MO. I hope folks from my home area will stop in, say HI to Jack and Janet, and maybe pick up a book while they’re at it! Special thanks to Jack and Janet Holtman for their desire to help me spread my message!